Punk'd! Season 5.2 opened with a sequence of disjointed images: a grave being dug, a painting covered in blood, Maggie crying... There's a funeral – Beth's, you assume. But the reappearance of the long-dead Lizzie and Mika clued us in that something more-than-usually awful was afoot... Yes, this was to be Tyreese's last stand – and what a beautiful, sombre, occasionally frustrating episode it was too. The plot of "What Happened And What's Going On" was simple: while the gang tried to reunite Noah with his family, Ty was bitten by a walker. The rest of the episode was a hallucinatory plunge deep into his unravelling mind as he was confronted by the angels and demons of his past. Look! There's Bob and Martin. Oh hi, The Governor! Consumed with guilt, the gentle giant struggled with the idea that perhaps a man of peace like him no longer had a place in the show's brutal world. 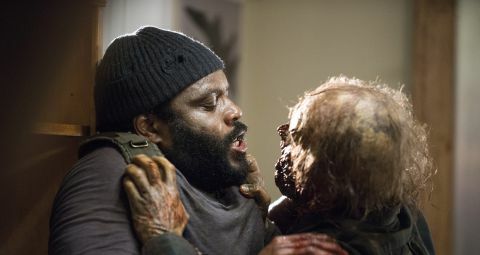 Tyreese hasn't always been the most compelling character – a shame given that he's a key player in the comics – but this is easily Coleman's strongest performance in the role. Nicotero and Gimple are The Walking Dead's creative dream team (if you'll excuse the pun) and this was certainly a bold way to start the new run. It's probably the show's more visually striking hour too, with bursts of light scorching out the sides of the screen and ragged cuts to show Ty's disintegrating reality. Lizzie and Mika pulling on his arm – which then becomes Rick and the gang hacking it off – is a startling and memorably grim image. Bear McCreary also did good work, with an elegiac and evocative score that had echoes of Morricone and Godspeed You! Black Emperor. Lovely. And yet... something about the episode felt unsatisfying. Another death coming straight after Beth's was definitely a surprise, but not a particularly big or welcome one. Killing lead characters is what The Walking Dead does and we all know that nobody is safe. Worryingly, it doesn't feel like their exits will change the shape of the show. At this point it would probably take the death of one of the big three – Rick, Carol, Daryl – to really shake things up. Perhaps I'm wrong. Scott Gimple has successfully steered The Walking Dead's creative renaissance this far, after all. It'll be interesting to look back on the episode in a few weeks' time. For now though it feels like another shock killing simply for the sake of it. The voice that Ty hears on the radio is actually Andrew Lincoln speaking in his real accent. He sounds dead posh. So, what's with that graffiti behind Michonne? “Wolves not far.” There was also the little matter of those dismembered corpses. Are the Wolves, perhaps, the show's take on Negan's Saviours? The song that Beth sings to Ty as he fights for his life is "Struggling Man" by reggae leg end Jimmy Cliff. Tyreese pops out for a bite and we see some old friends again.